Color variant of Mothra in the 1964 Mothra vs. Godzilla movie. Entertainment Earth Exclusive! 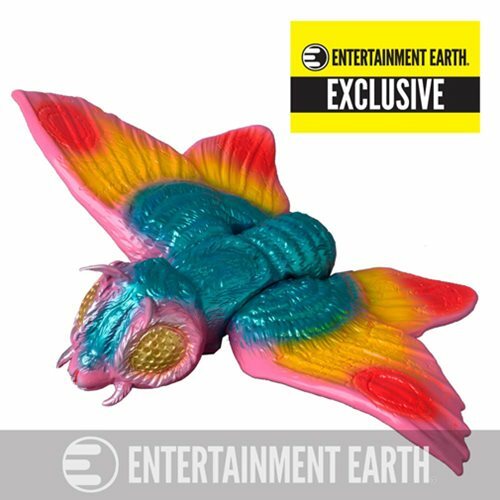 This handcrafted, hand-painted Godzilla Vinyl Wars Bullmark Mothra Sofubi Vinyl Figure - Entertainment Earth Exclusive, inspired by the designer toy movement, will hold a place of honor in your collection. Mothra's appearance in the 1964 Mothra vs. Godzilla movie is stunningly captured in this funky variant colorway, boasting an array of colors - pink, teal, red, yellow, and orange. The Godzilla Vinyl Wars Bullmark Mothra Sofubi Vinyl Figure - Entertainment Earth Exclusive is a limited edition of only 100 pieces. Mothra measures approximately over 7 4/5-inches wide total wingspan. Don't miss it! Ages 15 and up.